My group of friends and I are very open to vegetarian concepts (with one vegetarian and one former vegetarian among us), but with so many ho-hum vegetarian restaurants in the world of fine dining, our bar of expectation is almost always set at moderate at best. What we experienced at Ubuntu blew us away. I slightly knew what to expect from what I've heard of and read, but experiencing it oneself is another thing entirely. I was very impressed. Just from reading the menu, you come to realize you are in for an unparalleled dining experience. The dishes are aimed at tantalizing the mind first, then all the senses. We all started off our late lunch with shots of lovely green soup made of green garlic and fava leaves. It was garnished with a pickled radish. The soup tasted like a sip of the garden, a perfect amuse bouche to whet the appetite. Following that were our cold dishes. First, a steam bun stuffed with burrata cheese, the outside of which was coated in a sunchoke crumble. Also on the plate were crispy sunchoke tostones, baby lettuces, and mashua, which I wasn't familiar with until the server explained that it's a root vegetable that happens to be grown in the restaurant gardens. I've had sunchokes many times before, but this tostones preparation was the most tasty I've had. Next we had what my group termed the "little city" on a plate. It was a simple salad plated in a very contemporary way. This dish was composed of Chiogga beets (the candy-striped variety) in two preparations: cooked and dehydrated into crisps. The "salad of sorts" featured a rectangular base of smoked blue cheese and "bacon" avocado, basically a charred cube of avocado. The focaccia dish consisted of a wonderfully textured bread with apricot-almond agrodolce sauce, a salad of chard and watermelon radishes, and truffled pecorino cheese. We moved onto the warm dishes, which included a sumptuous fresh extruded pasta dressed with artichokes, caramelized grapefruit, and Midnight Moon cheese. The flavors were well-rounded, sweet, salty, and creamy. And what followed was a very flavorful Catalan-style chickpea stew with romesco sauce (a Spanish sauce like aioli), fried chickpea clusters, and a poached egg in the center. The stew had a great balance between sweet and savory and reminded me of Moroccan flavors. Both dishes were good enough to mop up with bread and had such great flavor that I almost forgot they were vegetarian. For someone who is a hearty meat-eater, that is saying something. I couldn't resist ordering all the desserts on the menu. What made the dessert dishes so appealing was that many featured savory components and/or vegetables. First we had a chocolate pudding with brown sugar crumble, tarragon-citrus granita, and satsuma segments. The dessert was refreshing and the sweetest of the bunch. I never would have thought to pair pudding with granita, but it worked entirely well. Next came the toffee-date cake with macadamia crumble and celeriac chips. The texture and look of the cake reminded me of the British sticky toffee pudding, which I imagine is what the pastry chef Carl Swanson was going for. The flavor, however, was much less sweet than the classic dessert. But I liked the dessert even more for that fact. The celeriac chips tasted surprisingly good, almost with a hint of natural caramelization. Next was what became my favorite dessert, which was also the most intriguing on the menu. It was the fennel pollen cake with fennel sorbet. The sweetness of the dessert was barely there, but the fennel ice cream came across as rich and creamy and the cake was light in texture and very aromatic. It hinged on savory, but was not salty as one might expect savory to be. What surrounded the cake were little balls of Fuji apples cooked in caramel, hazelnut crumbs, and dots of orange sauce. All the components made one glorious dessert. The cookies dessert, called "Carl's cookies 'n milk" on the menu, were a nice whimsical touch. (It's funny because I expected something "out there," so that the homey presentation—of a dish of cookies and a glass of milk—came off as a surprise.) The white chocolate cookies with lavender were tender and hot out of the oven. They were paired with a glass of milk from Straus Family Creamery, a dairy farm that you can find mentioned on restaurant menus across the Bay area. The desserts in their entirety were a sweet but not saccharine ending to a great meal. We had a very relaxing over two-hour late-lunch at Ubuntu that day. By the time we were ready to go, the restaurant had already cleared out and we were the last to leave before the staff would start preparing for the dinner rush. At the open kitchen we caught the chef just as he was prepping blood oranges and thanked him for a wonderful meal. Just the fact that you can get that close to the chef underlines the restaurant's philosophy about the closeness of humanity and the importance of getting closer to our food source. What better way to do that than seeing the chef cooking or the farmer farming. Being able to communicate with our food source is key to keeping a reciprocal conversation that benefits both sides. Not surprisingly, the work of chef Aaron London has gotten him noticed in the food world. His sun has been steadily rising. 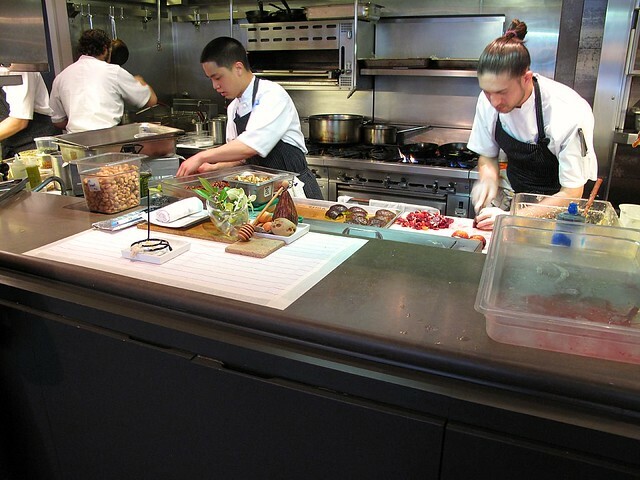 From staging in restaurant kitchens across the world to returning to his native northern California to work at Ubuntu, London has done a lot for someone in his late twenties. Just two days after my exceptional dining experience, he was nominated for a James Beard Award for rising star chef. He'd definitely get my vote. Open for dinner, Friday through Saturday, 5:30 p.m. to 9 p.m. and Sunday, Monday, and Thursday, 5:30 p.m. to 8:30 p.m. Open for lunch on Saturday and Sunday from 11:30 a.m. to 2:30 p.m. Closed on Tuesday and Wednesday. Prices range from $14 to $30.